Nokia Lumia 625 is the next position of Nokia Lumia series. Model is accompanied by five interchangeable covers in bright colors, which, together with live tiles offered by Windows Phone 8 increase the personalization of your smartphone. The Lumia 625 offers a number of features available in the flagship model, the Nokia Lumia 1020. These include integrated photographic applications such as Nokia Smart Camera, which allows you to remove unwanted objects from photos, as well as Nokia Kinograf that animates memories by adding motion pictures. Nokia Lumia 625 running Windows Phone 8 and update the Nokia Lumia Amber, offering advanced and user-friendly functions at an affordable price. Facilitate communication with your loved ones updated on a regular basis animated tiles on the home screen and Contacts application. Model also offers Xbox Live applications, and Microsoft Office, and 7 GB of memory useful for virtual disk SkyDrive. Nokia Lumia 625 gives users access to 165 000 entertainment applications, including Vimeo, FIFA 13 and PAYBACK, and Internet Explorer 10 provides secure browsing. Thanks to this new Nokia smartphone to check the video display, the use of games and all sorts of media. Nokia Lumia 625 also offers support for Micro SD memory card, which allows for 64 GB of additional memory. 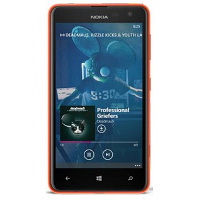 Available in smartphone Nokia Music allows free streaming music experience without ads, registration or subscription. To listen to your favorite songs in offline mode, users can download the playlist in advance. Large screen and super-fast connectivity on the Nokia Lumia 625 is HERE complement of services such as free maps and navigation on every corner. Remember that entered PIN on the website must be exactly the same as PIN entered in the setup program on your Nokia Lumia 625.